I’ve been thinking about peace quite a bit lately. I’m probably so obsessed with peace because my life is so wild. As I write this we are traveling. First Nebraska, then England and then Kenya, Africa! Wow! What a whirlwind. As I enjoy my very full life, I’ve been pausing and asking myself, “Am I feeling peaceful?” Ah. Such a great question. Key #1 – Praise is a partner to peace. When Paul calls us to a live of peace, he’s not calling us to be inauthentic. He’s not saying, “Pretend everything is great, and peace will guard your heart!” No. God is truth, and He calls us to deal with our anxieties with honesty. What remains in the dark can’t be healed. If we honestly pour out our hearts to Jesus, telling Him exactly how we feel, He can take our worries and exchange them for His grace. As we shift our focus to Christ and praise Him for His almighty character over our anxieties, He brings calm. The Holy Spirit changes our hearts and transforms anxiety into peace. Key #2 – Forgiveness is a partner to peace. When you’re holding anger and bitterness in your heart towards someone, you simply can’t experience peace. Instead, your mind engages in mental arguments, plots how to get even, and connives how to build walls so the other person can never hurt you again. When you forgive, peace enters and there is calm in the chaos. Over the weekend, I spoke about forgiveness. When you let others out of the prison in which you are keeping them – you set yourself free! And, you open the door to peace. Key #3 – Gratitude is a partner to peace. Cultivating a continual attitude of gratitude lowers blood pressure and quiets stomach ulcers. As we thank God for the beauty around us, for His goodness, and for the great gifts He gives us, our brain chemistry literally changes, and we’re much more able to dwell in peace (1 Thessalonians 5:18). Key #4 – Rest is a partner to peace. You can’t be governed by peace if you go nonstop 24/7. I know—I’ve tried! But rest is a part of God’s plan for our lives. It’s been suggested that in order to give your brain recovery time, you need 15 minutes per day of sitting in silence, with absolutely no technology, to day dream. Supposedly if you do this your creativity will begin to soar again. Now, in all honesty, I haven’t tried it yet – but it makes sense to me, and I’m going to try it soon. God has created our brains to need rest, silence, and beauty to revive peace. If we’re going to allow peace to rule in our hearts, we need to create the space for creative rest. 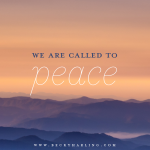 Peace can feel challenging, but I’m praying for you that the Lord of peace himself will give you peace at all times and in every way (1 Thessalonians 3:16). Steve and I are in England this week and then we leave for Kenya, Africa on Friday. Praise God the conference in Omaha, Nebraska went well! God did exceedingly more than we could have imagined. Thank you for praying! Please pray as Steve and I will be speaking seven times over the next week. Pray that God will do a deep work in the lives of those attending the conference. Thanks, Becky! A great reminder for this Monday morning. Blessings as you continue to bless others!